The Konftel 300M is perfect for companies that have mobile communications solutions. In addition to benefiting from the flexibility of its mobile solution, your company can have an uncompromising conference phone with smart functions and Konftel’s patented audio technology, OmniSound® 2.0, which ensures crystal-clear sound on all conference calls. The battery provides up to 30 hours of talk time and recharges when you place the Konftel 300M in its accompanying charging cradle. (You can use the phone while it is charging.) Other useful features include the ability to record to an SD memory card, SMS capabilities, and a conference guide that helps you save call groups—a huge help if you make regular multi-party calls. The USB computer connection enables you to make VoIP calls, and you can use the Konftel 300M in environments with unified communications solutions. Mobile and USB connections are easy to combine and switch using the phone’s line mode. With the battery charged and the SIM card fitted, the Konftel 300M is excellent for anyone who needs to get large or small meetings going quickly! Talk and move freely in the meeting room and the party on the other end will never notice a change in the audio quality. No irritating sound clipping, crackles, damping or echoes. OmniSound® with its Full Duplex and 360º sound pick-up offers you the benefit of enjoying excellent sound, every time – in every situation. The microphone provides omnidirectional sound pick-up and the three built-in surround speakers fills the room with crystal clear sound. OmniSound® is a registered trade mark. Our patented audio technology OmniSound® is embedded into all Konftelphones to ensure crystal-clear voice transmission. We’re now taking OmniSound® to the next level. 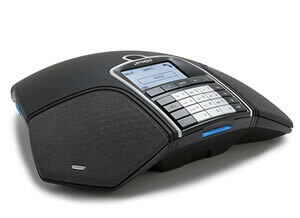 OmniSound® 2.0 provides the Konftel 300 with the capability to deliver even more impressive audio quality. OmniSound® uses full duplex, an omni-directional microphone and three speakers for optimal audio performance. OmniSound® 2.0 is enhanced with innovative features – noise suppression minimises distracting background noise, wideband voice transmission provides 7 kHz during VoIP calls and an equalizer allows you to adjust the sound during your meeting.